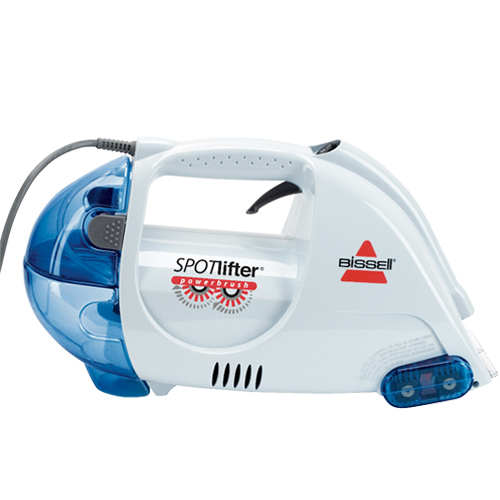 The Bissell SpotLifter Powerbrush 1716 Handheld Deep Cleaner removes stains, dirt, spills, and pet’s messes from carpets without the need for laborious blotting or scrubbing. Its light weight combined with the 18′ power cord allows it to be used in most any location in a typical household. The Bissell 1716/ 1716B spot cleaner scrubs, suctions, and dries in a single step and can be used on upholstery and automobile interiors as well as on carpets. Model numbers: The Bissell 1716 SpotLifter Powerbrush is also marketed with the model number Bissell 1716B. Bissell has lots of model numbers for the same cleaners with immaterial to slight variations. A lot of the time, the difference is due to the product being sold through different outlets, or a result of packaging differences. Other similar models include the Bissell 17164, 17169, 1716D, 1716H, 1716R and 1716T. When in doubt, double-check the product images and specifications before you purchase. This corded device provides the extra power needed to drive the motorized brushes for long periods of time, something that battery-operated devices cannot do. The 18′ long power cord allows the Bissell 1716 access to virtually any location in the average household. The cord features a circuit-interrupting device located near the outlet plug. This nifty cleaner is equipped with motorized rotating brushrolls, minimizing the manual effort associated with scrubbing off stains. The rotary scrubbing brush used to remove dirt and stains is mounted in a removable cartridge, making brush upkeep and replacement an easy task. 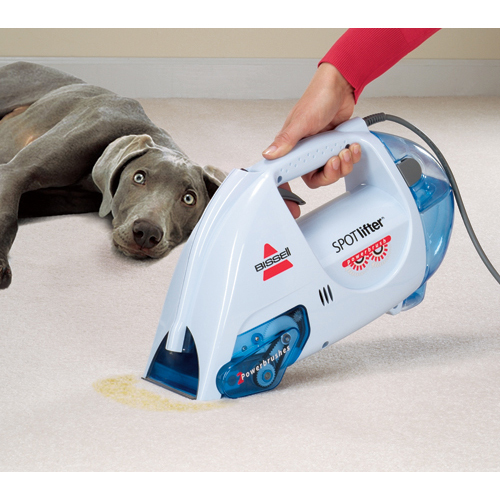 The motorized brushing gives carpets a better scrub, but some users felt that it added to the noise level. In comparison, the cordless Bissell 1719 spot cleaner that comes with a stationery brushhead received fewer complaints regarding it’s noise level. 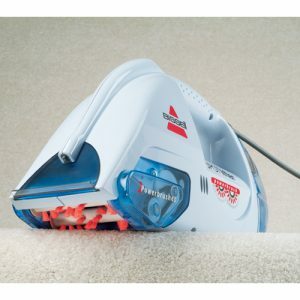 The 3 inch cleaning path is standard for small handheld Bissell cleaners. Although this hand held deep cleaner should only be operated when there is liquid in the solution tank it can be used in either a wet or a dry mode. The continuous suction feature enables dirt to be removed from carpets and other surfaces without first having to spray on liquids. The Bissell SpotLifter 1716 weighs 4 lbs. It is also compact, about the same size as a typical handheld vacuum. To compare, the cordless Bissell Portable Carpet Cleaner 1719 weighs 6.25 lbs. The manual spray trigger enables the amount of cleaning solution to be controlled, and also enables suction-only cleaning. The cleaning solution tank capacity is 8 oz and the capacity of the dirty-water collection tank is 12 oz. Both tanks have a quick-release capability and easily slide back into position when filled or emptied. The user guide gives clear, easy-to-follow instructions on how to use the SpotLifter, including how best to use the suction only feature. A troubleshooting section is included. This small cleaner has 2 amps of power operating from standard American 120V power sources. This is good power considering the size of the machine. The next level up would be the larger SpotClean Portable 5207 with 3 amps of power. The Bissell SpotLifter 1716/ 1716B portable deep carpet cleaner comes with a one-year limited warranty during which repairs of replacement will be made free of charge. Customer support can be reached by phone or live chat should problems arise. Largely because it is corded and not battery operated, the Model 1716B is a powerful device for its size and does a good job or removing older stains that have had a chance to set. It comes in especially handy for those who have one or more pets in their home. It cleans up pet messes quickly and easily and there is never a problem with having to wait for a battery to be recharged. A 15-minute run time on a single battery charge is not always long enough to clean up multiple spill, stains, or messes. The spray angle can be controlled by the manual switch as well as by the distance the unit is held above the carpet, so it can be as wide or as narrow as needed. A larger section of carpeting can be sprayed and the cleaning solution allowed to soak in, after which a smaller spray path can be used for the actual cleaning. The spray feature can be difficult to work however, and one’s hands can become tired when trying to spray over a large area. It needs to be kept in mind however that this device is primarily intended for use on smaller spots and stain, and not on large sections of carpeting. Some users have reported poor suction while others have reported great suction. The instruction manual tells how best to use the suction capability, which may account for the discrepancy. There is a similar handheld carpet cleaner model that is cordless. It’s called the Bissell SpotLifter 2X Essential 1719/ 1719T. If you have a strong need to use the cordless version, check out the Bissell SpotLifter 2X 1719/ 1719T review here. There is also a comparison of these two models in our Best Handheld Carpet Cleaners guide. Unused solution can be left in the tank when the unit is no longer in use, but the cleaning solution works better when mixed with warm water. Cleaning multiple old set-in stains can require a number of solution tank refills to complete the task, but once old stains have been removed, carpeting can usually be kept clean with minimal time and effort. The power brush does a good job of dislodging pet hair but vacuuming will usually be necessary to completely remove the hair from a carpet. Should You Buy the Bissell 1716/ 1716B SpotLifter Powerbrush Handheld Deep Cleaner? The Bissell SpotLifter Powerbrush Handheld Deep Cleaner 1716/ 1716B is a good buy if you keep one thing in mind; it is intended for use on smaller spots and stains. If you try to clean large areas of carpet, you may find the spray feature cumbersome to use. It is also important to read the instructions on how to best use the suction-only function. The one-year warranty can be viewed as a slight negative, but the Bissell 1716/ 1716B is inexpensive and reasonably durable. Not sure if the Bissell 1716/ 1716B is right for you? Check out other portable carpet cleaners. Limitation: We put every effort to provide the most accurate and helpful information but we cannot provide any warranties on this information. Please always research and use your discernment before you try the product or make a purchase.